Posted in Bright Ideas / Research on April 20, 2013. Quantity is still important - especially if all your competitors are on the high quality sites too! 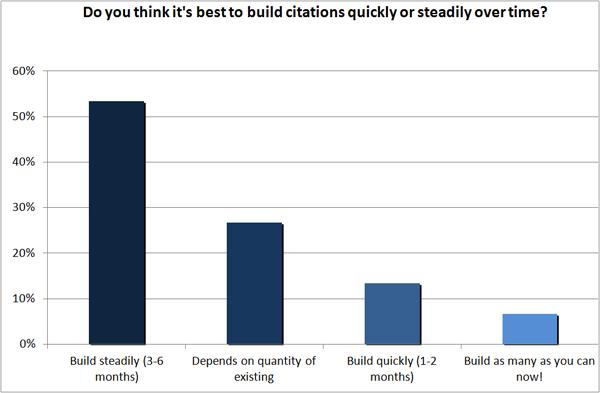 Citations should be built steadily over a few months - not hundreds in 1 month! The webinar was a timely one. On the same day the chaps from Getlisted.org updated their Local Search Ecosystem diagrams to show recent developments in the interrelationships and data networks which determine the spread of local data across the internet. Local data & local business listings (aka Citations) have always been an important aspect of Local Search but they are growing in importance. This data forms the backbone of an increasing number of local search services, directories, local-social applications, mobile apps & GPS navigation services. The number of consumers & therefore ‘potential customers’ viewing this data increases by the day – BIA/Kelsey predict that there will be 169 Billion ‘local searches’ conducted in 2016. Accuracy & Quality of Data is Essential! The accuracy of data is THE key issue for both data providers and businesses. Consumers need to be able to trust the data they find about a business – there’s nothing more frustrating than turning up at a shop or restaurant which has closed down, moved or never even been located at that address! Completeness & accuracy of data is a key factor in local search ranking – 3 of the top 10 local ranking factors are citation related with ‘consistency’ & ‘quality’ cited as the the most powerful of these. With the increasing diversity of data sources & growth in consumer generated content the task of managing data has never been more complex & time consuming. To help our customers, SMBs & SEOs understand the importance of citations and what to focus their efforts on, we enlisted the help of some highly respected, knowledgeable and ‘generous’* search experts. Please note, that the 2015 Expert Citation Survey is published here. We put together a 10 question survey which is 100% focused on local citations. We ask & answer some key questions which occupy the minds of local search marketeers and SMBs across the globe. See the results & comments published below. ‘Comments’ are provided by me (Myles Anderson). This is my take on the results of the survey and do not necessarily reflect the beliefs of the survey participants. Qu 1 – How important are accurate citations to local search ranking? So, citations are important! Stop press, hold the phones, breaking news! This won’t (or shouldn’t) come as a surprise to anyone familiar with local search and it supports the findings of the Local Search Ranking Factors study. But it’s nice to have a clear & positive statistic to use and support any discussions we have with clients about the value & validity of citation optimization. 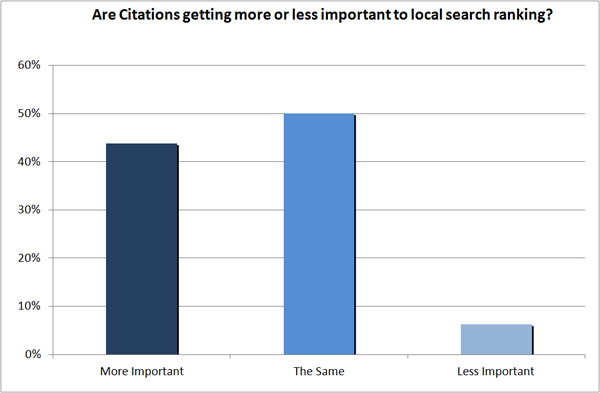 Qu 2 – Are Citations getting more or less important to local search ranking? Qu 3 – What is more important – quantity or quality of citations? 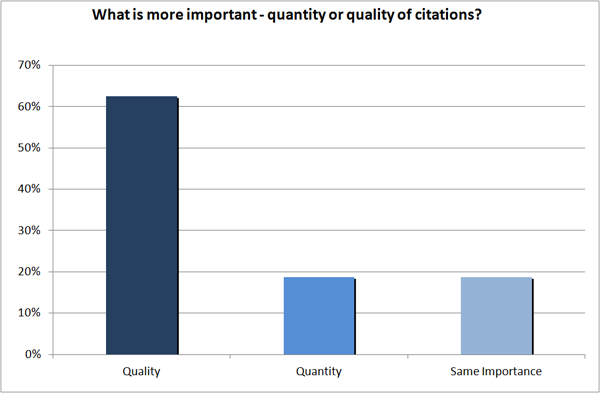 Although quality of citations is more important, sheer volume of citations still has an influence on ranking. 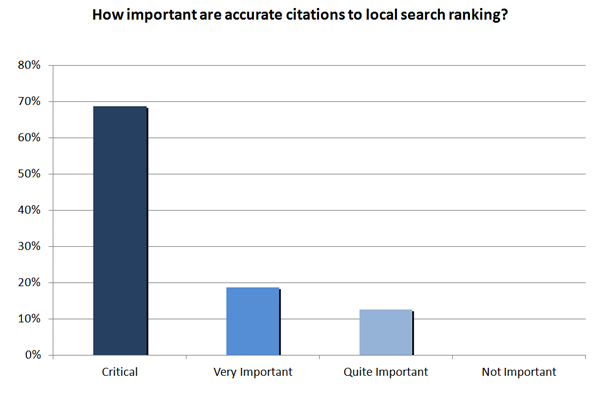 Quantity of structured citations is the 6th most influential factor in the 2013 Local Search Ranking Factors survey. So getting a spread of citations across a wide range of relevant & appropriate sites is still a very valid and beneficial task for an SMB or SEO to tackle. Note – ‘Quality’ in this respect refers to the quality or authority of the site on which a citation exists; it doesn’t mean the completeness or accuracy of a listing itself. See Qu 4 for more on this. Qu 4 – Which type of sites are most valuable for citations? ‘National’ directories include high authority such as Yelp & Citysearch. 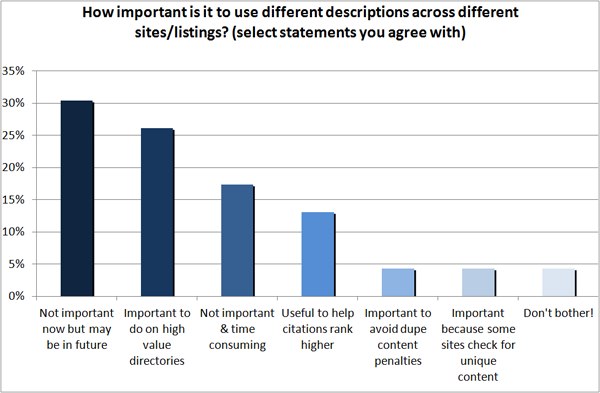 In question 3 (above) we found that having citations on quality sites is more important than sheer volume of citations. Quality is defined by the authority & trusted nature of a site. Google trusts the data on sites like Yelp & Citysearch because they are a known quantity; they are professionally run and – despite their issues – put a lot of emphasis on the quality & accuracy of their data. They also have recognised brands & a strong linking profile which contribute to their authority score. 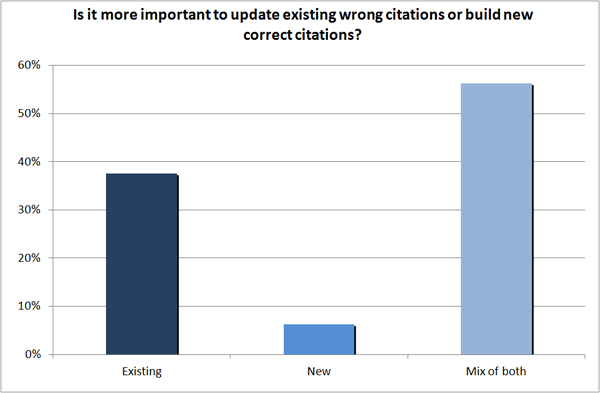 Qu 5 – Is it more important to update existing wrong citations or build new correct citations? Given the results of the 2013 Local Search Ranking Factors study which puts ‘Consistency of Structured Citations‘ as the 3rd most powerful factor, it’s not surprising that correcting incorrect citations wins out. In previous years quantity of citations was considered a more important factor but that is no longer the case. Poor quality data can be poisonous to a business’s success both online & offline and correcting existing inconsistencies should be #1 on the to do list for any SMB & consultant when it comes to citations. Qu 6 – How important is it to merge or delete duplicate citations? The steps to take are often not clearly laid out and the success rate is low which leaves so many of us frustrated & irritated. This experience may inform (skew?) the answers of some respondents – they have seen greater success in completing other citation tasks so focus on those first. At BrightLocal we have a team of 25 submissions agents who are dedicated to claiming, updating & generating new citations. We’ve looked at numerous automated & manual methods for finding, deleting & merging listings and it’s not an easy one. It’s interesting to note that even automated publishing services like Yext haven’t cracked this particular nut. And these guys have a direct pipe into 30+ key directories, but even they can’t merge or remove duplicate listings with any great success. Qu 7 – Do you think it’s best to build citations quickly or steadily over time? Only 7% say to build as many as you can NOW! Qu 8 – Does address formatting need to be 100% perfect or do small differences not matter? There is an element of subjectivity in what 1 person considers to be ‘100% perfect’. My personal feeling is that as long as the key data is correct (e.g. street number, zipcode, phone number) then nuances in formatting of words such as street, suite, South/North don’t matter. Often certain sites will force their own formatting on addresses so it’s out your hands anyway. Google understands this and is intelligent enough to handle subtle & regular variations in formatting – i’m sure they have the processing power to determine that ‘Mac n Cheese’ located at 154 South Street 96553 is the same business as ‘Mac n Cheese’ at 154 S. Street 96553. “As far as address formatting goes, different sites tend to use different standards of abbreviation. This ‘irregular’ standardization forces reputable sites, like Google, to use they’re own standardized matching algorithms to yield better, more unified crawl results. Moral of the story is, don’t intentionally alternate between Road and Rd, but don’t stress over it if it happens.” Phil Britten. This additional ‘rich’ information is useful to both users & Google. Knowing the type of services, opening hours, payment options is useful information for potential customers. It also supports the data you load into Google+ and gives Google further proof points to corroborate the data it has about a business. Qu 10 – How important is it to use different descriptions across different sites/listings?